TORONTO - Recent high-profile shootings in Toronto should prompt authorities at all levels to do more than crack down on gun-toting thugs, experts said Tuesday, as some fretted the city is developing an American-style gun problem. They said politicians have failed to come to grips with the root causes of gang involvement and to find ways to help at-risk youth. "If this makes the city wake up and say, 'We're going to do something about it,' ultimately, that's a good thing," said Prof. Irvin Waller, a criminologist with the University of Ottawa. "It's a combination of smart enforcement and effective prevention." The key, Waller said from Buenos Aires, is to spend money on outreach that helps young men finish school, get job training and find work. As investigators scrambled to sort out the latest incident that left two people dead and 24 hurt, attention turned to the role of street gangs and their seeming indifference to wider public safety. "It is just kids that have guns and shouldn't have guns who seize an opportunity because it is powerful to have a gun," said Eugene Jones, head of the Toronto Community Housing Corp.
"Then it is us great citizens who are left trying to protect ourselves because we feel so vulnerable." On Monday night, gunfire caused panic, death and injury — a toddler was among those hurt — as hundreds of people attended an annual community-organized block party in the city's east end. Police Chief Bill Blair said officers were looking at gang involvement but refused to speculate on patterns. "There'll be time to reflect on trends and place this in context," Blair said. "Right now, we're looking very specifically at this event." The violence comes on the heels of last month's afternoon shooting at a foodcourt in the landmark downtown Eaton Centre that left two people dead and several bystanders injured. On an afternoon days later, a gunman walked into restaurant and shot dead a 35-year-old man and injured another in the city's west end. 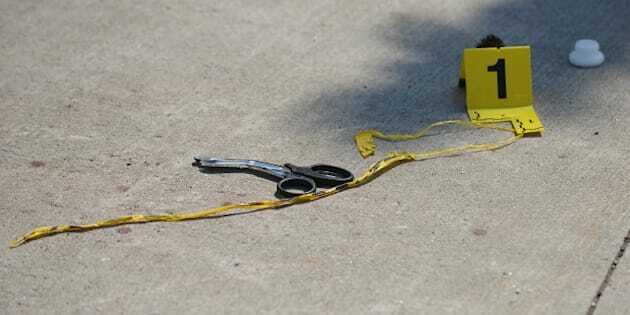 Scot Wortley, a criminologist with the University of Toronto, said the nature of violent crime — which statistics show has declined significantly — has changed over the past decade. The violence is more likely now to involve young men from disadvantaged communities and more likely to play out in public spaces, Wortley said. One theory is that street-gang activity has increased in Canada's urban centres and is, by its nature, more likely to occur in public settings when rivals come upon another. "Sometimes the gang culture just basically stipulates that you're going to settle your conflicts any time any place," Wortley said. "There is a bravado that permeates: You must demonstrate that you are willing to use violence any time any place, regardless of the consequences." Another possibility is that fear of violence is prompting more young men to carry guns, along with a willingness to use the weapons in a misguided form of self-defence. As he did after the Eaton Centre shooting, Mayor Rob Ford was quick to call Monday's mayhem an "isolated incident." "Toronto is not like Detroit," Ford said. "Toronto is the safest city in North America." While the city is significantly safer than many U.S. cities, Wortley called it imperative to examine the social and economic situations in "deteriorating inner city and inner suburb communities." Too many young men in marginalized communities are alienated from mainstream society — a situation exacerbated by bleak job prospects that make street-gangs an attractive sub-culture. "You may be seeing within an increasingly economically polarized society ... that turning to crime or gangs is seen as an only option," Wortley said. "A lot of young people that I've interviewed in these communities feel hopeless."